Congratulations, you've found the ultimate Branson Missouri Online Travel Guide! 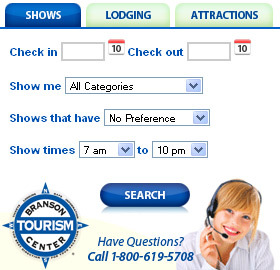 There's loads of information about Branson lodging, shows, Branson MO attractions, restaurants, and lakes. Continue reading "7 Egg-Citing Ways to Spend Easter in Branson"
Continue reading "Legends in Concert … our favorites!" Continue reading "World Exclusive Exhibit at Titanic Museum Attraction ~ the Lifejackets"
#1 Hits of the 60's! Continue reading "#1 Hits of the 60’s!" Dolly Parton's Stampede ~ Celebrating 25 Years in Branson! Continue reading "Dolly Parton’s Stampede ~ Celebrating 25 Years in Branson!" Continue reading "Landshark Bar & Grill, Branson’s Newest Dining Establishment"
Continue reading "What’s Happening! 2019 in Branson"
Continue reading "Grand Country … for a Grand Time in Branson!" Continue reading "Branson’s Titanic Museum Attraction"
Continue reading "The Butterfly Palace & Rainforest Adventure ~ Step into another world!" Terry Sanders aka Homer Lee Branson Windmill Inn Scotty's Trout Dock & Marina Branson Vacation Houses Meadow Brook Nightly Condo Rental - Brookside Getaway Peggy Don Yates at Tri-Lakes Realtors River Run Outfitters (Flyfishing) Branson Lakeside Condo Rentals Charlie Gerken, Branson Real Estate Agent Janet Bezzerides, Aux Arcs Real Estate Inc.
YAKOV SMIRNOFF SAYS, "IT'S TIME FOR A GOOD LAUGH"